A Mod for Star Wars Knights of The Old Republic Author: N-DReW25 Release Date: 24.01.2019 Installation: Open "For Override" and select the mod option you want. 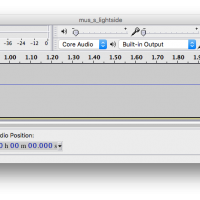 Drop the file inside the folder into your K1 override. Uninstallation: Delete the files you copied into the Override folder. 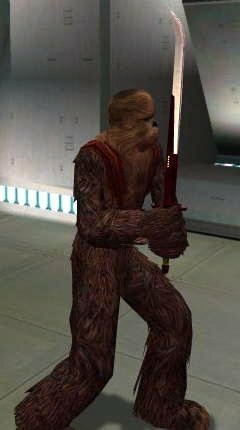 Description: When you complete Zaalbar's sidequest on Kashyyyk you receive a sacred Wookiee weapon called "Bacca's Ceremonial Blade". It has a description that reads "The great Bacca was hunting the Shadowlands ages ago when an alien ship crashed through the forest. He saw that first contact as a warning of the destruction outsiders could bring. Made from the debris, this sword is a reminder for his people that trust must be given cautiously, and only to those who have earned it." When searching the game files I found a placeholder/leftover inside the Chieftan Hall module called "Bacca's Sword". It had a description that reads "This sword is forever linked to the most revered figure in Wookiee lore, Bacca. A great and wise warrior, Bacca was hunting in the Shadowlands ages ago when an alien ship crashed through the upper boughs of the forest. The tale varies with each telling, but whether he had to fight the inhabitants or just found them obliterated in the wreckage, he understood their coming as a sign. There was life elsewhere in the galaxy, and it might not come to Kashyyyk with peace in mind. Bacca supposedly constructed this weapon from components found among the debris, and over time it became a symbol of leadership. It reminds his people that trust must be given cautiously, and only to those that have earned it. The blade shows no signs of wear, though the leather grip is well worn." This cut description is clearly more detailed and extensive than the vanilla description. This mod restores this extended description and adds an option to restore the "Bacca's Sword" name as well. Known Bugs: This mod shouldn't have bugs but if there is Just PM me on Deadlystream. Incompatibilities: None that I'm aware Permissions: Do NOT claim credit for this mod and do not use assets from this mod without my permission Thanks: Bioware for such an amazing game Fred Tetra for Kotor Tool and everyone who downloads the mod. Legal: THIS MODIFICATION IS NOT SUPPORTED BY BIOWARE/OBSIDIAN ENTERTAINMENT, LUCASARTS, DISNEY OR ANY LICENSERS/SPONSORS OF THE MENTIONED COMPANIES. USE OF THIS FILE IS AT YOUR OWN RISK AND THE ABOVE MENTIONED COMPANIES OR THE AUTHOR IS NOT RESPONSIBLE FOR ANY DAMAGE CAUSED TO YOUR COMPUTER FOR THE USAGE OF THIS FILE. When you first meet HK-47 in KotOR II: TSL, he’s basically junk until you put him back together. I’ve always wanted this evolution from a piece of junk to a high quality assassin droid to be visible on HK-47, so that’s where this mod comes from. With this mod, the HK-47 you find in your cargo hold looks like the piece of junk he is but over time you replace his parts with new ones and he returns to his old self we know from the first game. This is not a purely cosmetical change however. 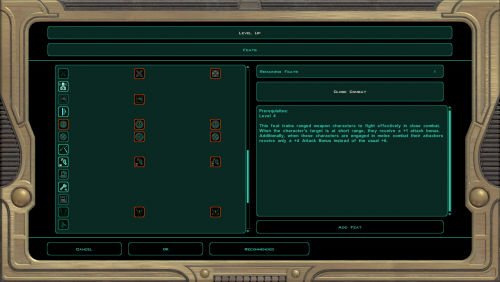 I restored HK’s upgrades from KotOR 1 and each time you repair/upgrade him, he’ll look better and get a stat bonus. The requirements to unlock these upgrades increase with each successful upgrade: For the first one you need to be level 6, have a repair skill of 8 and at least 41 influence with HK-47; for the last one you need level 15, 17 repair and 51 influence. Optionally you can also install HD reskins for HK-50 and HK-51. All of the new textures are based on Quanon’s excellent HK-47 reskin for KotOR 1. See a video demonstration of this mod here: Installation: Run TSLPatcher.exe and choose the version you want to install. Then simply let TSL Patcher do its magic. When asked to select the folder where TSL is installed, choose the folder that includes swkotor2.exe or if you have TSLRCM from the Steam Workshop, choose its folder. Do NOT delete the backup folder that is created during the installation, you'll need it if you ever want to uninstall this mod. For modders: I included the source scripts in the download in case you're interested. Ignore them if you only want to install and play the mod. Uninstallation: Take all the files from this mod’s tslpatchdata folder and delete those from your Override folder (except for the .nss and .mp3 files). Also delete hk_repair.ncs from your Override and the .mp3 files from streamvoice/GBL/HK47. Then copy all files from the backup folder created during the installation of this mod into your Override. Compabilitiy: This mod is NOT compatible with ANY mods that alter HK-47’s appearance in any way. The HK-50/HK-51 reskin option is also not compatible with mods that alter the appearance of HK-50 and HK-51 either. Most other mods however should be compatible. 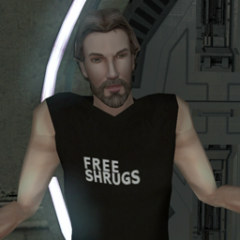 Changelog: 1.0 Initial release Credits: Mod by Kexikus HK-47 texture by Quanon (modified by Kexikus) TSL Patcher by stoffe THIS MOD IS NOT SUPPORTED BY LUCASARTS OR OBSIDIAN. USE THIS FILE AT YOUR OWN RISK. NEITHER THE AUTHOR OF THIS MOD NOR THE COMPANIES MENTIONED ABOVE ARE RESPONSIBLE FOR ANY DAMAGE TO YOUR COMPUTER WHEN USING THIS FILE. That's normal. Creatures models typically have a limited stock of animations. It might be possible to get it to use the player supermodel, but that probably isn't necessary unless you want to fight it or something. It likely has idle and talk animations already, and should be suitable for your standard background NPC. This mod corrects some errors in the feat.2da file, which determines what classes can get what feats. First, a number of feats available to the base Jedi classes were not available to the prestige classes. This appears to be an error, given the inconsistency. It wasn't even that no prestige classes could take them. For some feats, certain tiers were available but not the rest. Other feats were available to some classes but locked out of others, despite being available to all Jedi classes. So I've gone through and set all feats that seem like they were meant for all Jedi classes to be available for all Jedi classes. The affected feats are: Caution Close Combat Dual Strike Empathy Gear Head Regenerate Vitality Second, the Finesse: Lightsabers feat was redundant, because Finesse: Melee Weapons applies to both melee weapons and lightsabers. This was probably not the intent, but these feats are hard-coded, so I have no way of fixing them. So I chose to remove the ability to select Finesse: Lightsabers at all. If you want to build a finessing character and receive the benefits of this feat, you can select Finesse: Melee Weapons instead and get it for melee weapons as well as lightsabers. May the Force serve you well. Be back stronger; and looking forwards to some good news! An addition to JC's further insight here: not only the skin is low-res as it sized at 256x256; but it's also a low-poly model. An example of higher poly model in-game is c_gammorean (Gamorrean). Comparison: The Gamorreans also uses higher-res texture, sized at 512x512 Also looking for possible correction for these 2c from whom an expertise on this matter. Edit: There's a hint for low-poly model in-game; they initialized with "L_" on their naming. 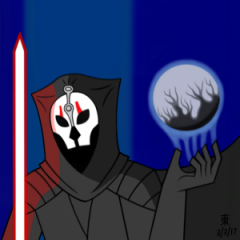 @PurpleClone Has already requested this mod, and I am fulfilling the request. The model is already all there, yes. I don't know if there's any VO for it, though, and I don't recall what SpaceAlex was doing with it either. But they could easily be put in somewhere. In the latest news nexus removed all gamefront mods from their site(or at least hid them). Check nexus's news feed . It is an interesting situation (but it won't restore your faith in humanity). Sending it now. Now scram kid, you're botherin' me. Hello everyone! I just wanted to stop by and give everyone an update on the Community Patches. Although I've started to have a little bit more of a normal schedule these days, I'm still really busy and as much as I'd like to work on modding KOTOR, it always seems to slip further and further down my TODO list. However, there's still lots to do on the patches, and I don't want them to stagnate, so towards that end I'm giving @JCarter426 and @DarthParametric permission to update both of the community patches. They are both veteran modders who understand the spirit of the patches, and will take good care of it I'm sure! This doesn't mean I'm done working on them, just that I'm bringing in other people to the project for its own good I'll still work on it whenever I get the chance for sure! Thanks again for all your well wishes and support!! I actually love them, however they almost always clash with the music that's already playing and ends up sounding awful. Nice work. After a flurry of activity, I'm done for now. My next projects will be up when my contributors hand over the requested files to me. Yes, NONE of the recent uploads were what I was hinting at previously. I can but wish you the best of luck and a swift return to your virtual family here at Deadlystream. I do hope the situation will be only temporary. Previous message. Luckily though this is still the case I am sort of around again now, read the latest post for more info. Next message. Thank you for the concern! I'm doing alright, things have just been really crazy. My baby girl has some serious brain damage and we've been in and out of the hospital a lot recently (Although it looks like we're home for a good stretch now). I also just got a full-time job and I'm still finishing up a web project that I started a long time ago. So all things considered, I have pretty much no time for anything right now. Hopefully it'll only be another couple weeks before things will settle down and I can take up modding again though...I miss it! For those of you who are the praying type, our little girl's name is Fiona, and we're standing in faith for healing, if you'd be so kind as to pray with us for that Also my wife is at home taking care of her all day, so that can get pretty tough sometimes, and she'd definitely appreciate your prayers as well. Thank you all!